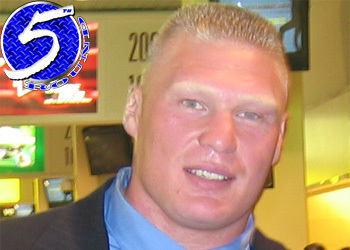 Brock Lesnar has been auspiciously chipper this UFC 116 fight week. The former WWE superstar is notorious for his grumpy demeanor the closer game time gets. Today, the Nevada State Athletic Commission revealed why the heavyweight champ has been all smiles of late. According to MMAWeekly.com, interim title holder Shane Carwin will earn $40,000 to show and another $40K if he leaves the MGM Grand Garden Arena in Las Vegas, Nevada victorious. Based on Octagon math, Lesnar is 10 times more (fill in the blank) than Carwin. If that’s the case, fans should bet the farm on Brock because the Gambling Gods aren’t overwhelmingly convinced he’s gonna unify the heavyweight crown in his second straight outing. Lesnar at -140 is almost as bargain basement as it gets. In co-main event news, Chris Leben gets a bump up from his $35,000 show/$35,000 win performance at “The Ultimate Fighter 11 Finale” to $43,000 show/$43,000 win. Despite fighting less than two weeks ago, the slugger gladly stepped in to replace an injured Wanderlei Silva to face Yoshihiro Akiyama. Sexyama will receive $45,000 for his second UFC contest and another $25,000 if he’s able to collect his 14th victory. * – These numbers indicate the fighter purses which are required to be reported to the NSAC. They DO NOT include pay-per-view bonuses, performance bonuses, sponsorship dollars or other sources of income that fighters may receive. So best believe Lesnar and Carwin aren’t leaving Las Vegas with just the numbers presented above.